Tintype supports emerging and established international artists. Our gallery programme is informed and led by artists' practices. 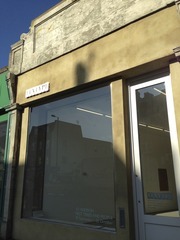 Once a year we offer the gallery as a project space leading to a subsequent show. Tintype regularly hosts talks and performance events. The gallery was started by Teresa Grimes and Pat Treasure in 2010. Teresa Grimes became sole-director in 2014.